We bought a zoo membership shortly after we moved here, and we use it fairly often. Since we are at the zoo once a month or so, I rarely remember to take pictures. I do occasionally get a photo, and since I am in a catching up mood (read: trying to avoid having to clean out the refrigerator), here are a couple of recent zoo trips. I say recent, but, with all of our traveling in the last couple of months, these pictures are from the end of March, when we went to the zoo with our friends Carrie and Spencer. Spencer is a few weeks older than Eloise. This peacock thinks he owns the zoo. He is famous for terrorizing children who come too close to him. 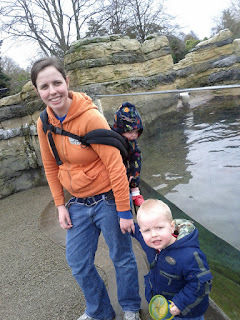 Here we are outside the penguin tank. This has a great view for small kids because the penguins frequently swim very close to the glass at their eye level. 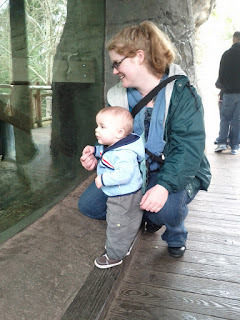 Spencer was enthralled by the orangutans. They put on a great show of tearing up rolls of paper towels to make nests for themselves. 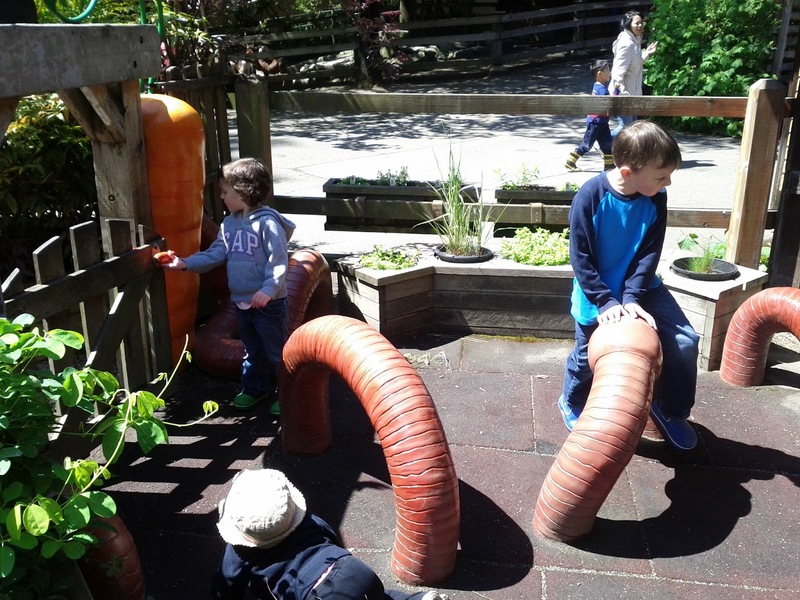 Our last stop at the zoo is usually the Zoomazium, where there are play structures and toys for kids under eight. 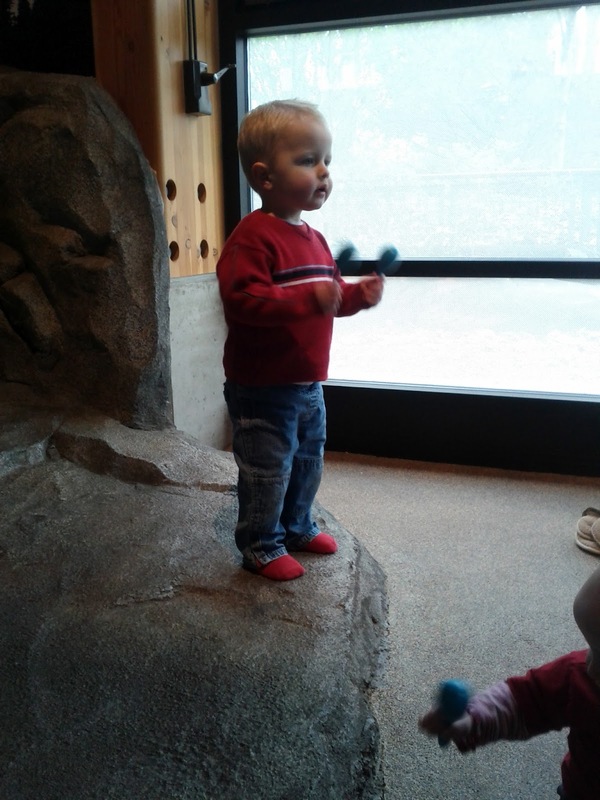 Sometimes we go for zoo music. 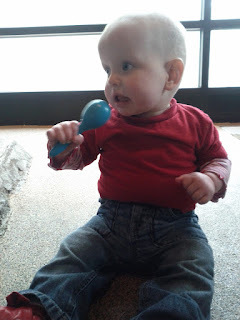 Jared and Eloise love to shake, rattle, and roar to songs about conservation and animal droppings. They were excited to introduce Spencer to one of their favorite activities. Spencer is very lively, so he loves anything active. 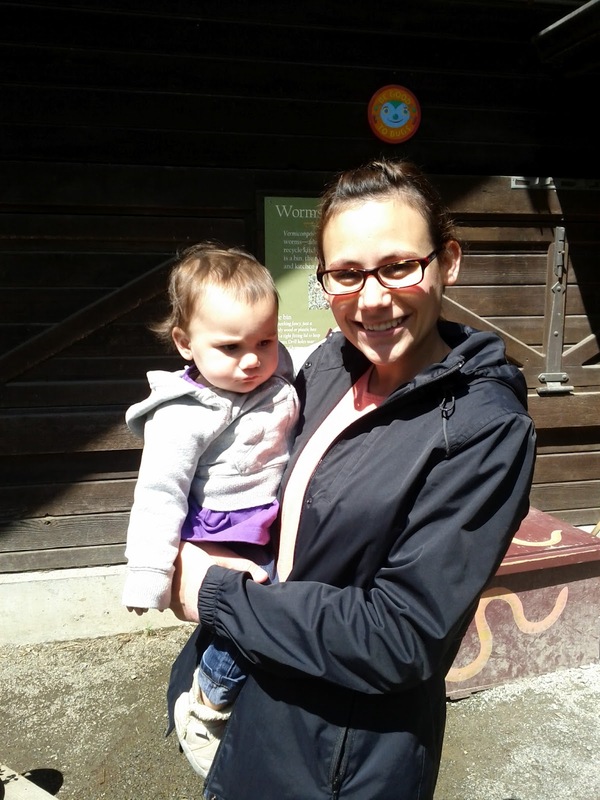 On June 6, we went to the zoo again with Ricki, Levi, Vivian, and Ramona. Vivian is a couple of weeks older than Jared, and Ramona is about a week younger than Eloise. 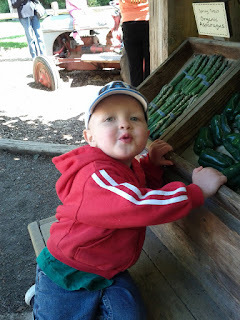 Levi and Vivian found this little playground in the farm exhibit. The Knight children are always excited about a new playground. When we take pictures, we tell Jared to say "Eeeeee!" Of course he says "Ooooooo!" instead. Eloise got really excited about this stationary vegetable exhibit. She threw quite the fit when it was time for us to move on. A 13 month old will not accept that she is going to an even better playground. She is particularly stubborn when she is tired. I could not believe that in our three hours in the zoo, Ramona only got out of the stroller one time! She didn't complain once. What kind of child is this? Are all third children this easy going? I hope so. 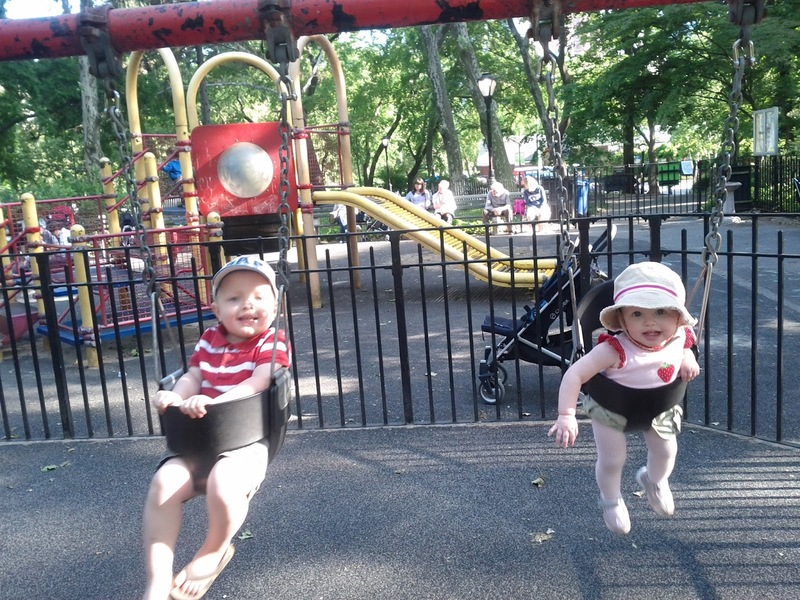 Jared and Eloise are both pretty laid back, but not three hours in the stroller laid back. We are glad we have such great friends, and such a great zoo. 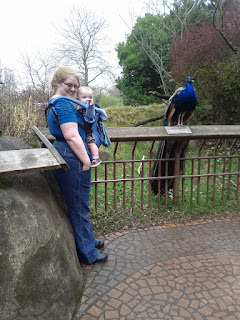 Next time I will have to get a picture that actually has an animal in it so that you can tell this is a zoo. Friday, May 18, was my 25th birthday. We spent the morning fighting our way through New York City traffic, trying to get to the Manhattan temple to see Faith and Jorge go through the temple for the first time. To say New York City traffic is bad would be a serious understatement. If there are three lanes on the road, there are sure to be at least four "lanes" of traffic moving, or not moving. Prepare to move no faster than five miles an hour for long stretches, and remember, the yellow ones don't stop. If we hadn't experienced San Francisco traffic, Todd would not have been equipped for this kind of traffic stress. Even so, this was a whole new level of crazy driving. 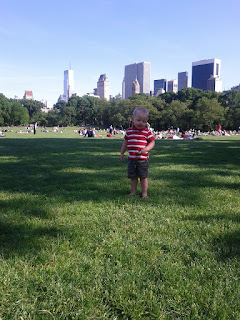 When we finally got to our destination, we left the kids with Lauren, Matt, Seth, and Jessica in Central park to play, and walked the block from there to the temple. The Manhattan temple is located on the upper floors of a building that also contains a family history center, a distribution center, and a stake center. It looks like your standard seven story New York real estate, only with the trademark angel statue on top, but inside is beautiful and surprisingly quiet. It was lovely and serene after our stressful drive. Coincidentally, my parents met for the first time at a dance in this building when it was just a stake center (no temple) in 1985. When we came out of the temple it was waaaaay past lunch time, and we were starving. We went in search of some New York pizza. 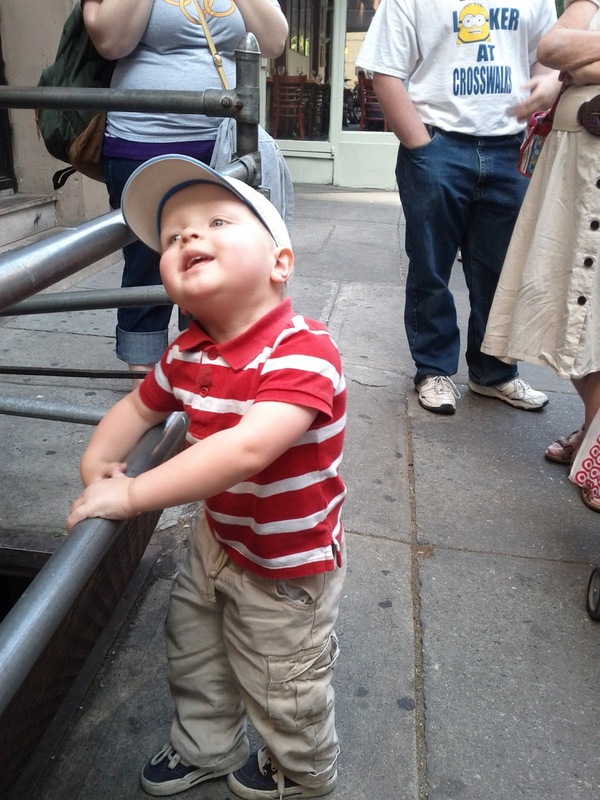 Here is Jared waiting for Daddy to bring out the pizza. Jessica, Matt, Faith, and Jorge. Faith and Jorge were dressed for Matt to take some bridal shots in Central Park after we ate. Mmmmmmmmm. Lovely, greasy, gigantic New York pizzas for my birthday in Central Park. 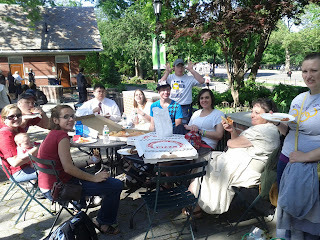 After lunch, some of the group went to take pictures, some went to Chinatown, and we stayed in Central Park. We found a nice big field to play in with a great skyline. We shared a popsicle. 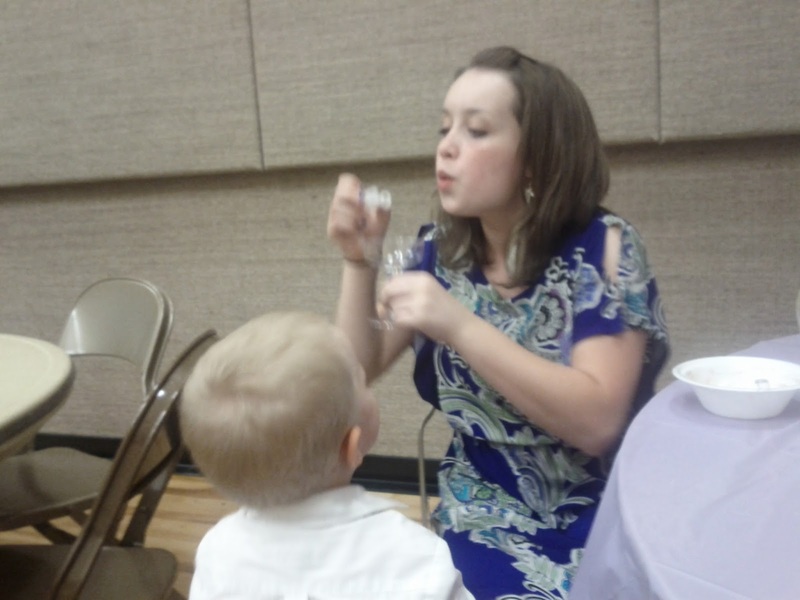 Parents are physically incapable of feeding babies without making dumb faces. It's a verifiable fact. 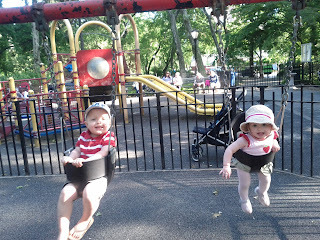 Jared and Eloise loved this Central Park playground for a few minutes before we headed back to our hotel. That night the boys bachelor partied at a dumb action movie, and we ladies had a very brief bachelorette/birthday party, complete with surprise flowers and key lime pie for me from my sisters. I have the best sisters ever. We were tired, though, and didn't play for too long. 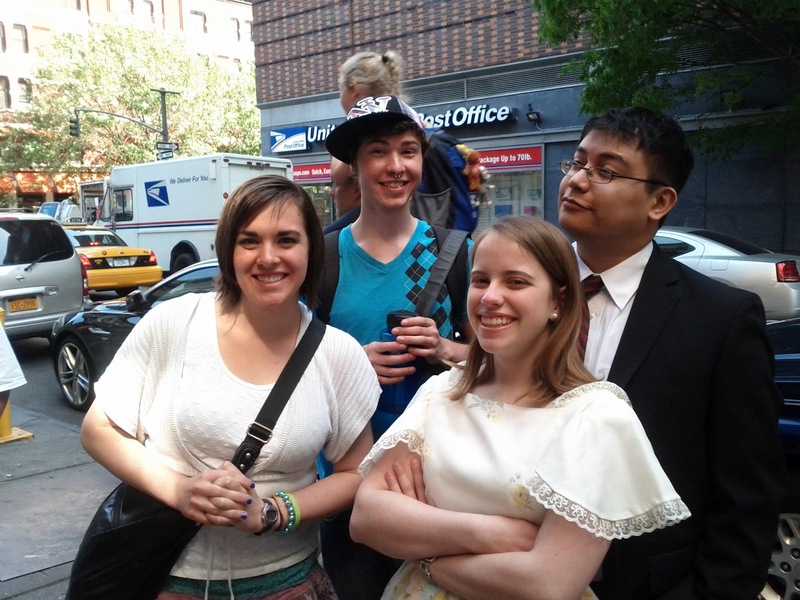 On Saturday, May 19, Faith and Jorge were sealed for time and all eternity in the Manhattan LDS temple. Our trusty babysitting crew watched the kids in a nursery in the stake center portion of the temple building. We took a few pictures outside the temple, a few pictures in Central Park, and then we all packed up to drive to Newburgh for the reception. All of the fun with cousins had worn our kids out. Jared fell asleep with a french fry in his hand and one in his lap, and slept for a good portion of the drive. Jared really enjoyed the reception. He loves to introduce himself to new people. He goes really close to their faces and asks, "What's your name?" Then he says, "Nice to meet you!" 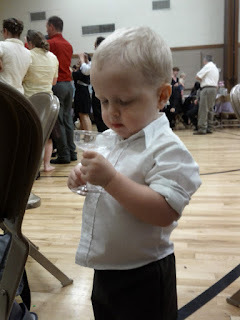 He also enjoyed drinking soda and water from these funny cups. Eloise, who had developed a red rash on her face just in time for wedding pictures, also had a good time. You can see Jared dancing it up in the background of this picture. Eloise and Maren had matching dresses, thanks to Aunt Anni. 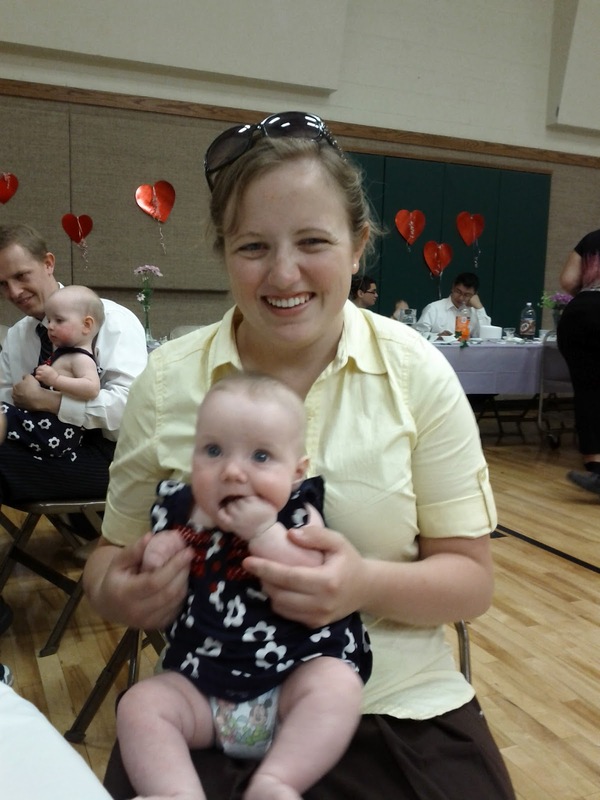 Here is a better picture of chubby little Maren. Bubbles! Need I say more? 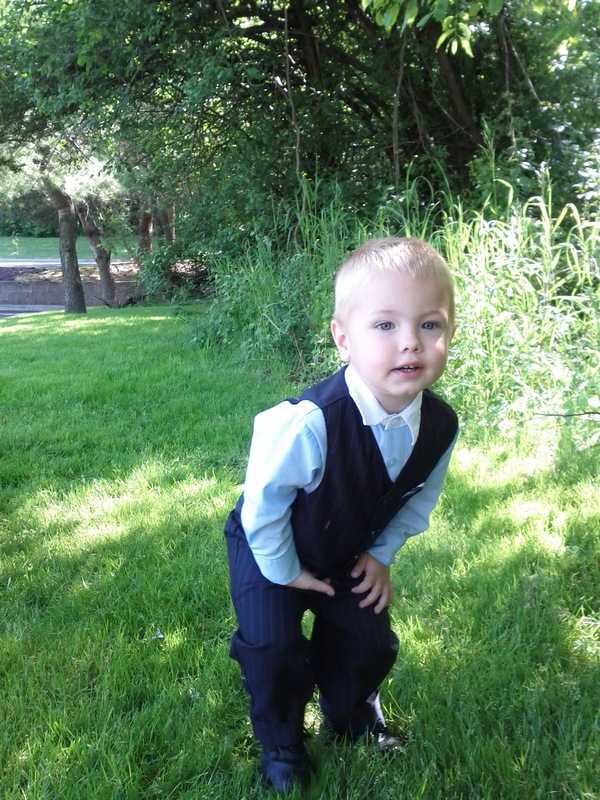 Jared's shoes were removed early in the evening, thanks to the influence of his cousin, Aaron. 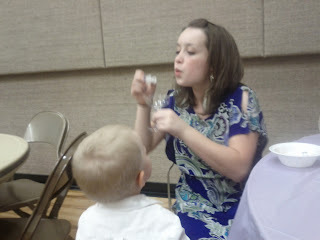 Jared formed an instant bond with my cousin, Natalie, when she helped him with bubbles. 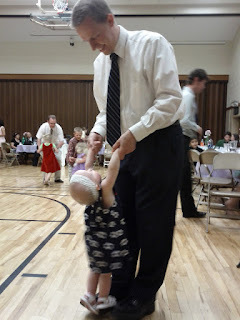 Faith had a dance with our dad, who we got to see only for the afternoon. Jared made utensil bouquets in special cups. Some folks, whose identities we will protect, vandalized Jorge's car. Jorge was not pleased. Eventually we said our goodbyes to almost everyone and headed to our hotel for the night. We were happy and exhausted. Congratulations Faith and Jorge! On Sunday we met Cheyenne, Lauren, and Aaron for church. We were a little bit early, so Jared and Aaron played outside while Eloise napped in the car. 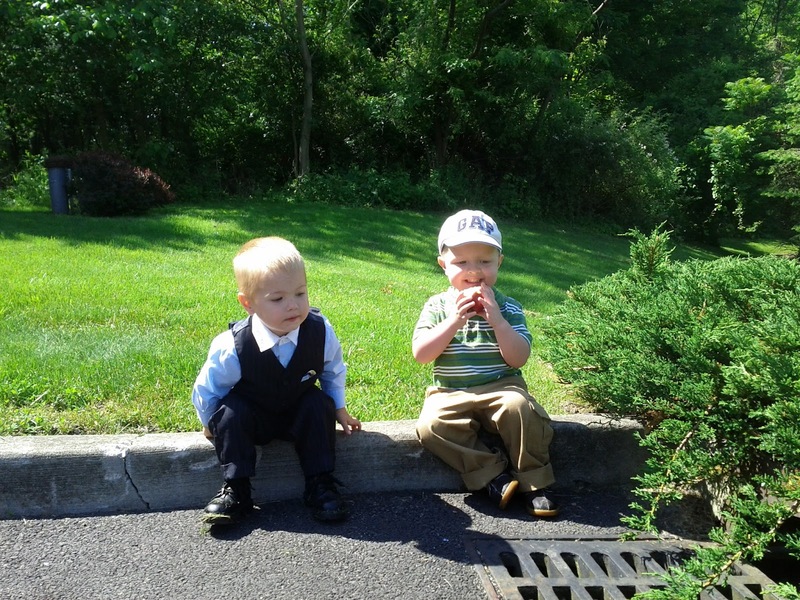 These cousins have really missed each other since we parted after church that day. 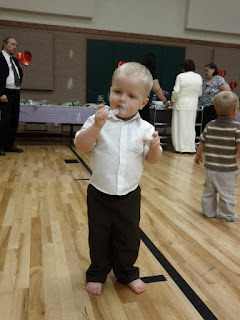 We shared a quick lunch after sacrament meeting. Cheyenne then headed back to Georgia to meet Andrew, who came back from his year's deployment in Afghanistan while they were away, and was anxiously awaiting their return. We went to our hotel in Newark to enjoy the simple pleasures of our last night in a hotel before a VERY early flight the next morning. 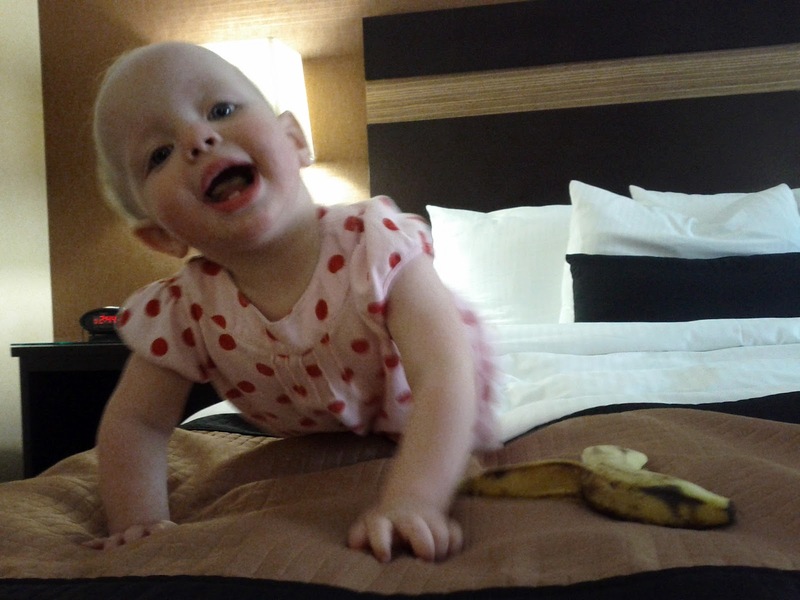 Eloise was pretty happy about bananas in bed. 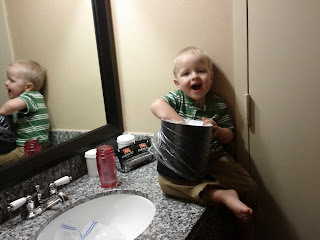 Jared had a heyday with the ice bucket. We had a great time in New York seeing the sights, enjoying the warm sunshine, and spending time with family, but we were glad to get home and settle slowly back into our routine. 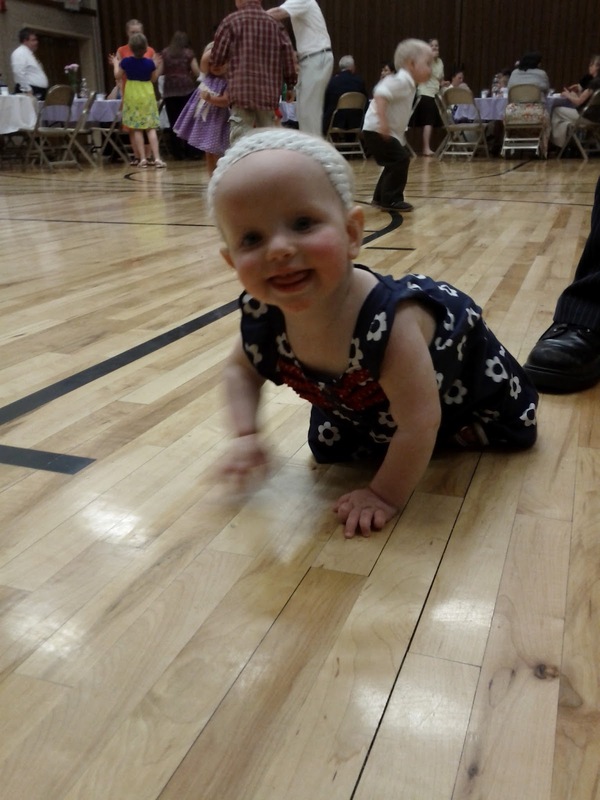 On May 14, our family had the opportunity to fly to New York for my sister, Faith's, wedding. 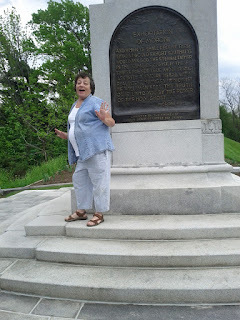 We went out a few days early so that we could see some of the important sites to the restoration of the gospel of Jesus Christ and the organization of the Church of Jesus Christ of Latter Day Saints on the earth in the early 19th century. We flew to Newark on the afternoon of the 14th, and drove to Newburgh, NY, where Faith's fiance, Jorge, grew up, to spend the night. Family members trickled in all evening, and by morning we were all there, and ready to push off on the next leg of our journey: a five hour drive to Palmyra, in upstate New York. Jared and Eloise were troopers for all of the driving. There was very little whining while we were driving. Eloise started to hate getting into the carseat, and potty stops increased as we went along, but all in all, the drive could have been a lot worse. We decided at the last minute to detour to Fayette, New York, where the LDS church was officially organized on April 6, 1830. Here is a picture of a restored period cabin on the site where the Whitmer farm stood. The prophet Joseph Smith was living here when he organized the church on this very spot. It is a very beautiful place in some very beautiful farm country. I would like to now show you an awesome picture of our family taken at this location, but this is about it. I believe Jared is trying to put his finger in my eye. In other versions of this picture Eloise had her finger in my eye, or Jared was trying to leap from Todd's arms. Not our most successful photo shoot, but we were really happy to be there. I think Jared even understood the significance of the place on a very simple level. We spent the night near Palmyra and spent the following day (Wednesday, May 16) visiting important sites in Palmyra. 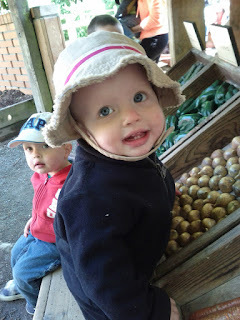 First we went to the Smith family farm. The rest of the family met early for a family devotional in the Sacred Grove, where Joseph Smith received a vision of God the Father and his son, Jesus Christ. We were travel weary and jet lagged, so we met up with everyone else later in the morning at the Smith family farm. Here are Aaron, Cheyenne, and Ryan (carrying baby Maren) going into the cabin where the Smith family lived when Joseph Smith received his first vision, and several visitations from angels. Jared loves poking around in other people's houses. 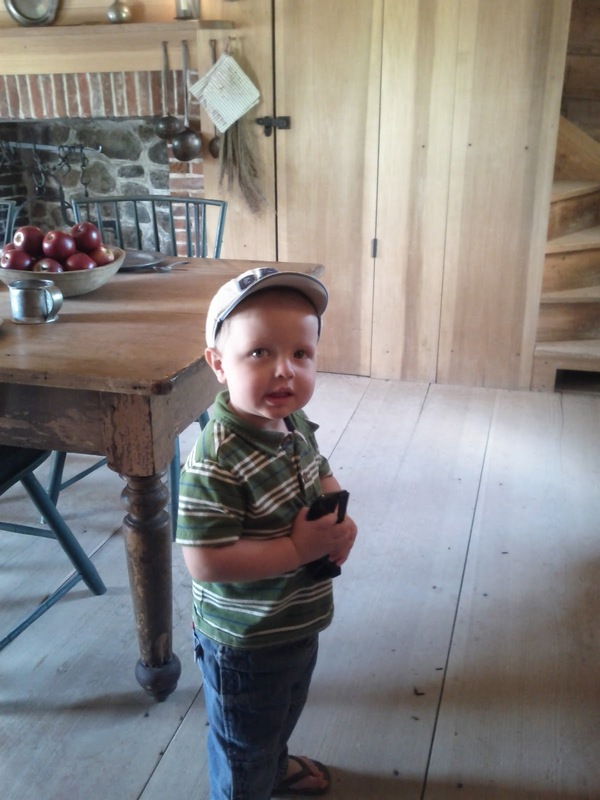 He loved touring these restored cabins. On the road between the cabin and the larger Smith home, there is a beautiful viewpoint of the Palmyra temple. Our family is on the left, next to my mom, then Faith, Lauren (who came with Cheyenne to help with babysitting), Cheyenne, Aaron (who would not look away from the temple once he spotted it), Annika, Maren, and Ryan. We actually got a pretty good portrait at the Smith home. This makes up for our Whitmer farm picture disaster. 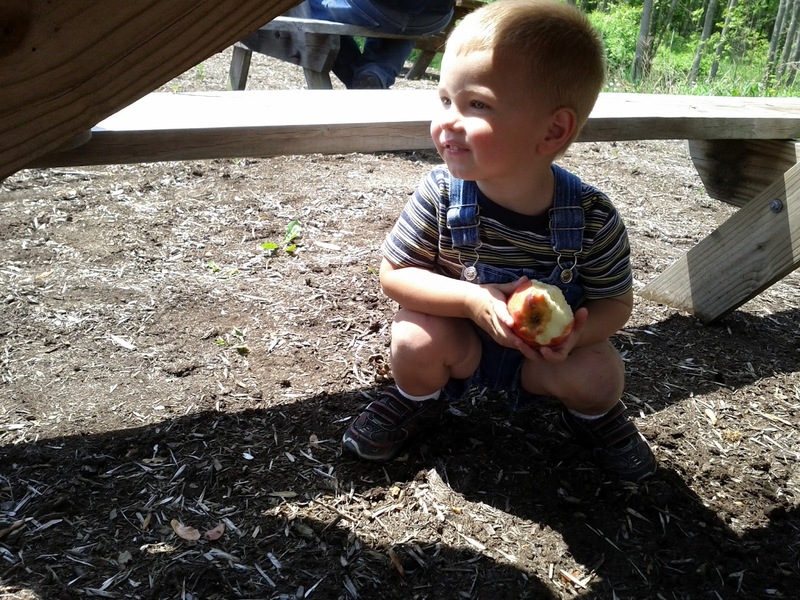 After touring the farm and learning a little bit about it, we had a picnic lunch. Here is Aaron hiding from the hot sun under a picnic table. 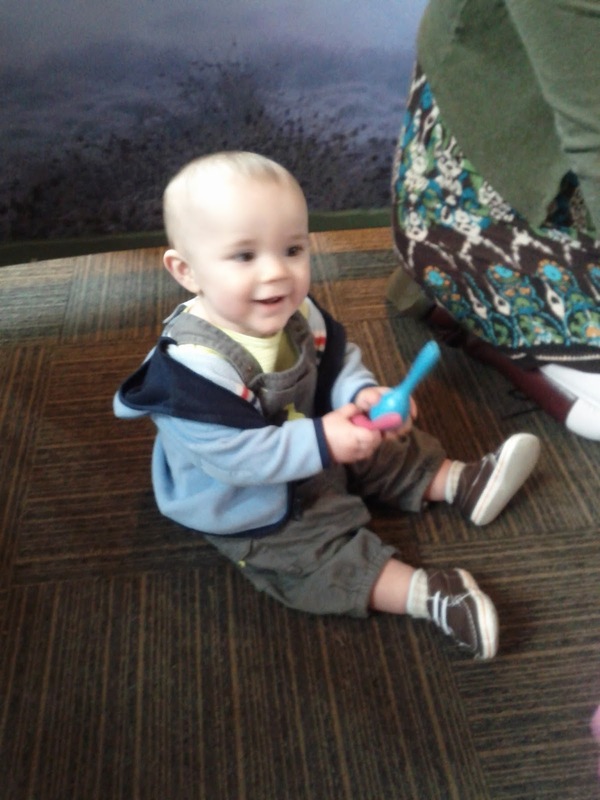 After lunch we went to the Palmyra temple to play and rest for a little while. Eventually the wind started to pick up, and we decided that we had better go take in some more outdoor sites before we got soaked in a downpour. 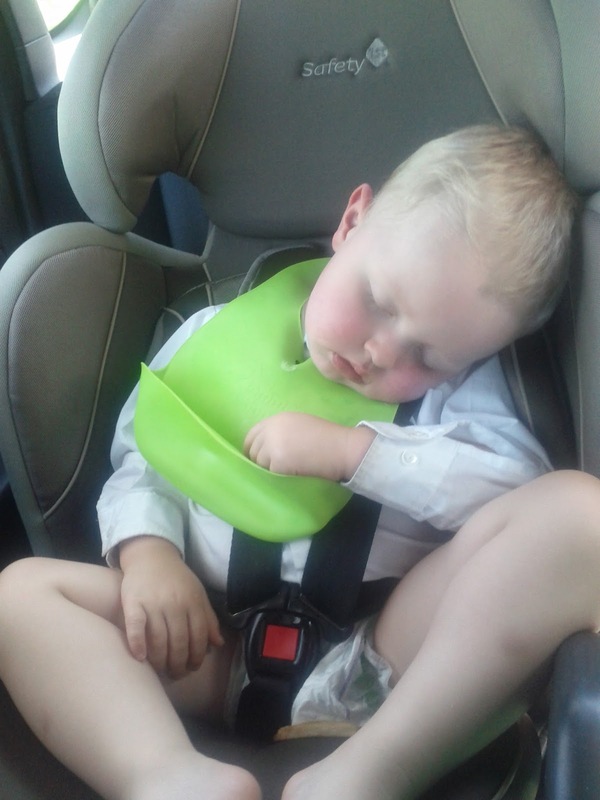 On the three minute drive between the temple and the Hill Cumorah, Aaron and Eloise fell asleep. We let Eloise nap in her carseat while we checked out the monument. On this hill, the ancient prophet Moroni buried the plates containing the record of his people as they were about to be destroyed. Moroni appeared to Joseph Smith as an angel and directed him to this spot to find the record, which he later translated, by the power of God. The record is now published as the Book of Mormon. 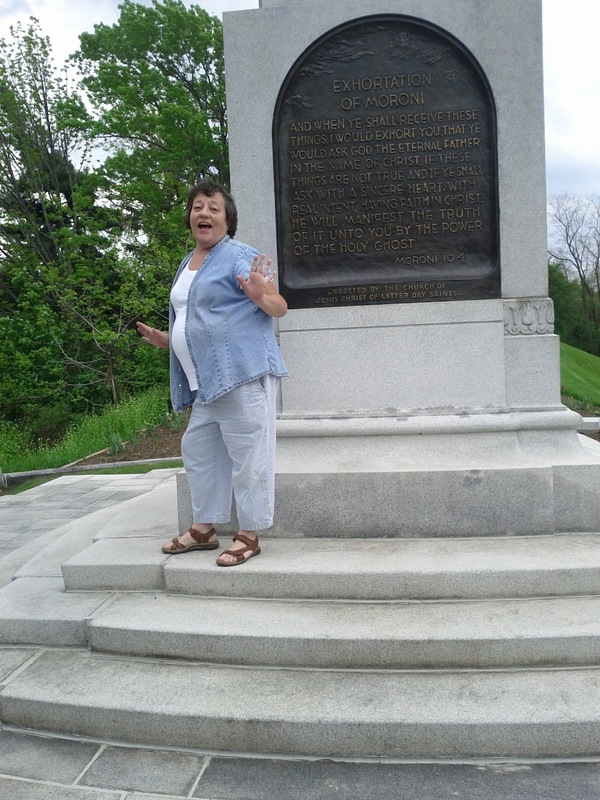 Classy Grandma finally smiled for the camera at the Hill Cumorah monument. 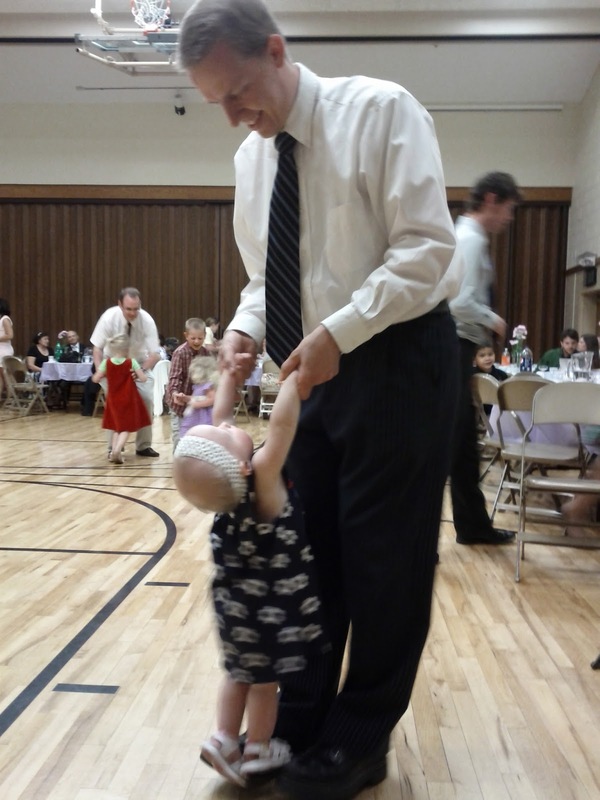 We experienced a Hill Cumorah miracle. When we drove up the hill it was raining, but the rain slowed to a stop as we got out of the car, and didn't start again until we were driving back down. After our stop at the Hill Cumorah, we drove into Palmyra proper to see the Grandin press where the Book of Mormon was first published. Here is a dark picture of Anni, Ryan, and baby Maren at the press. I just remembered that I never actually posted about Miss Maren being born. I am not very on top of things lately. Maren was born February 5, 2012, on her due date. She is cute and round and squishy, and oh-so-sweet. Ryan ran into a couple of friends from back home in tiny little Price, Utah serving as missionaries in the Grandin press. It's a small world. The Grandin tour got a little bit too long for a couple of toured out little Knights, who don't have a lot of interest in 19th century printing and bookmaking techniques. 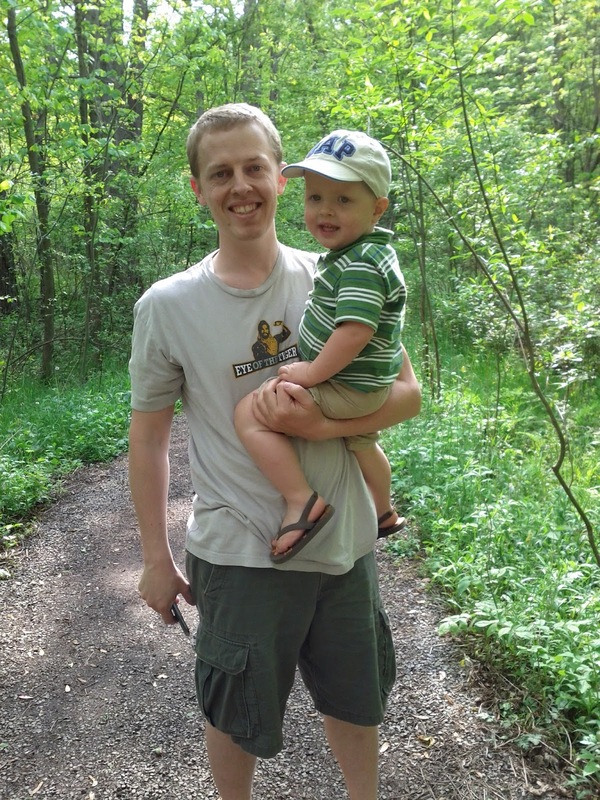 When we could pull ourselves away, we took our family over to the sacred grove. Here is Jared's sacred grove portrait. 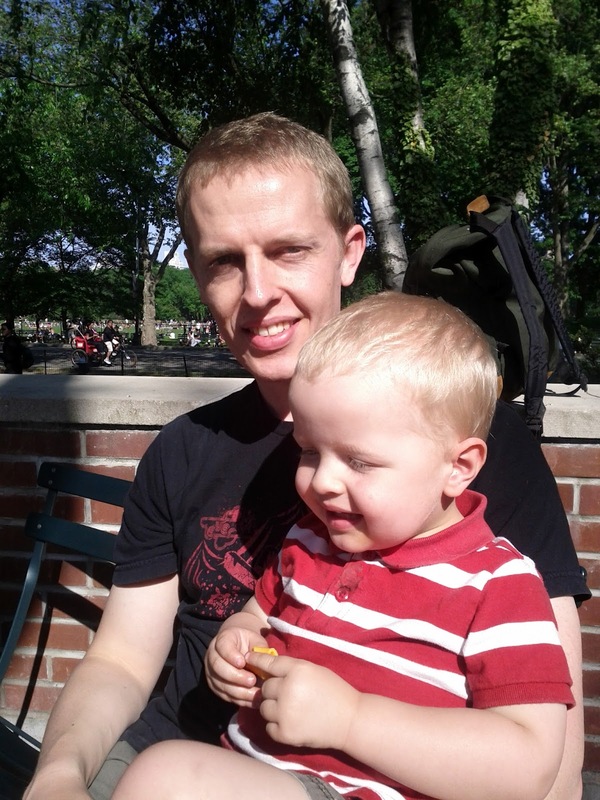 We have been learning a lot about Joseph Smith in our family this year, since we are reading the Doctrine and Covenants (a book of revelations, mostly received by Joseph Smith). Jared really liked the sacred grove. Todd has incredible family picture skills. He reached out to take the picture, everyone looked, and looked happy, and our moment was immortalized. I am glad we got to visit all of these places that we had only read about. I hope Jared and Eloise will remember something about their experience in these sacred places. We caravanned part way back through New York that evening, stopping in time for dinner and a cousin bath. On Thursday, we all took different routes to our hotel in Newark. The Knights drove through Pennsylvania, stopping for a picnic lunch in Scranton, the setting of the TV show "The Office." We didn't have any Dwight sightings, though. The Warnock car drove through New York City to get some sightseeing in. The Jensen car took Faith back to Poughkeepsie to pick up some things for her and Jorge, who joined us that night. Seth flew into New York that afternoon, and Faith's friends Matt and Jessica met up with us for the remainder of the trip. On Thursday evening, Todd and I watched all of the kids while most of the group went to New York City to see Broadway shows. Jared and Aaron had a great time watching for airplanes out the window of their hotel room, which faced toward the Newark airport, and watching "Ice Age." 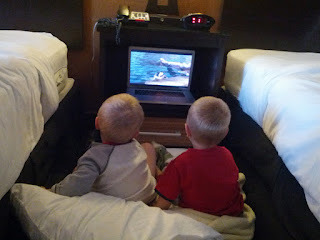 It was nice to have a restful evening in with the kids after all of the traveling and sightseeing of the last few days, and before all of the wedding craziness of Friday and Saturday began. Here he is in Lake Washington with Jared. 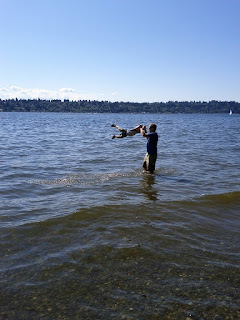 That water is seriously cold, but I'm not sure who had more fun out of the two of these guys. 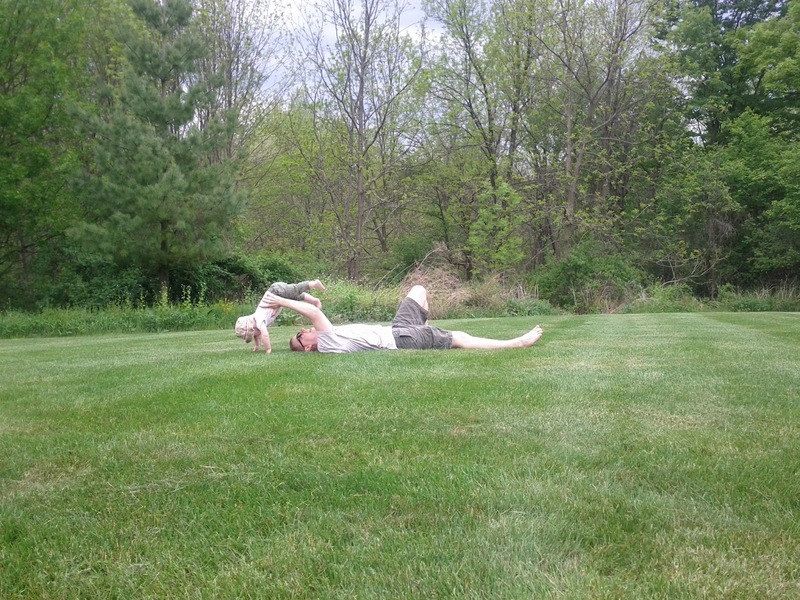 On the Palmyra, New York temple grounds with Eloise. Daddy will do ANYTHING to get this girl to laugh. 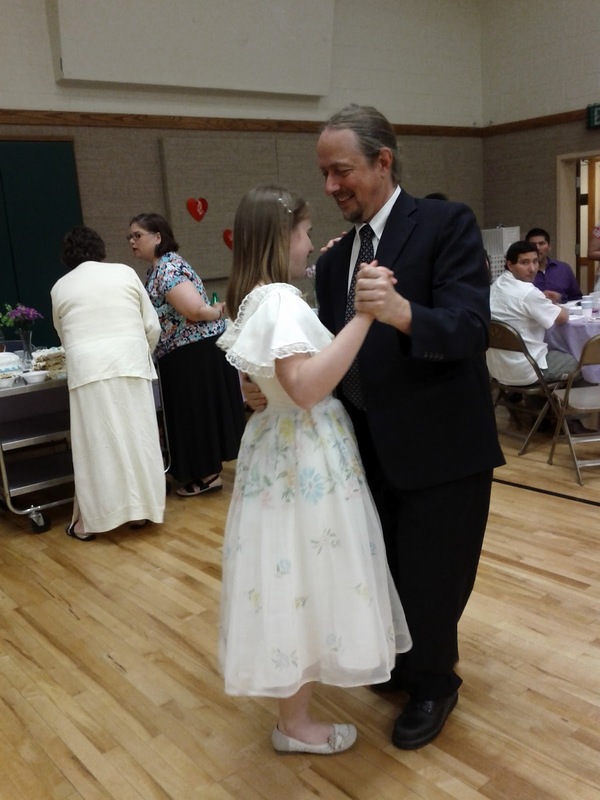 Dancing at Faith and Jorge's wedding. 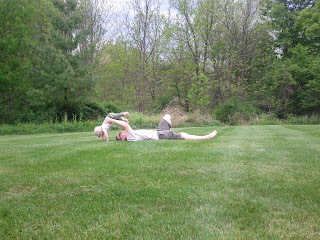 Eloise is really attached to her daddy. I got really excited once because I thought she was saying "Mommy." It turned out she was just blowing noisy spit bubbles. She does talk about "Dadden" at least a hundred times a day. 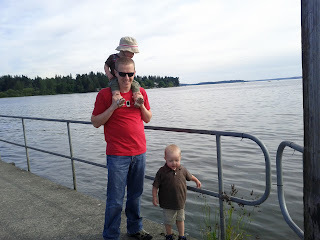 In Lake Washington again, trying to convert Eloise to his water loving ways. She doesn't dislike water. 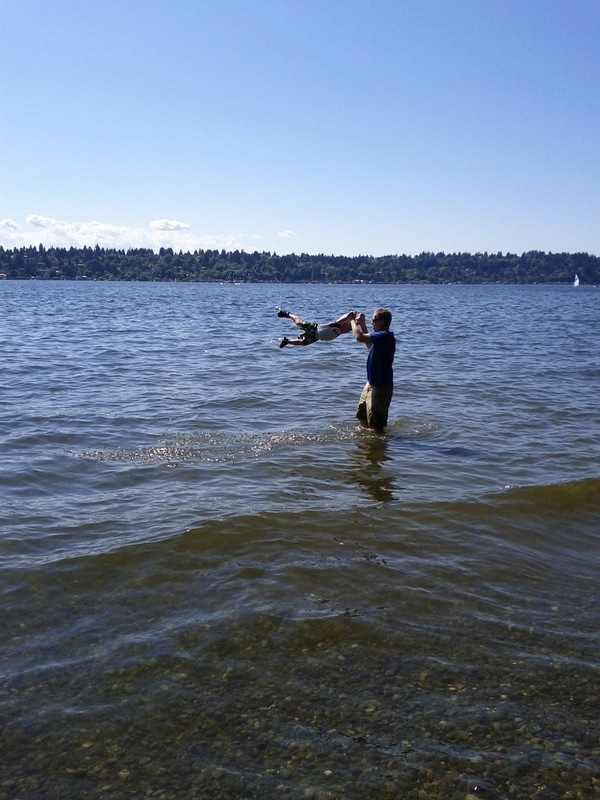 She dislikes any part of her person being submersed in frigid, snow-melt water. 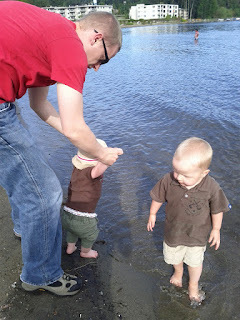 We picked Daddy up at work on Monday for a pre-family home evening activity at the beach park. Does he look like he's tired after a long day at work? Not this Daddy. He is ready to play. 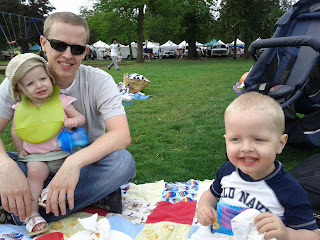 On Friday, Daddy met us at the park for a farmers' market picnic of wood fired pizza and pasta salad. I'm not sure he got to eat at all with two very wound up children vying for his attention. Eloise contrived all sorts of excuses to sit in his lap. This morning, Jared, Eloise, and I took Daddy waffles in bed. When he asked to bring them to the table to eat with the rest of the family, Jared, shocked at the suggestion, informed Daddy that waffles in bed must be eaten in bed. Poor Daddy was forced to eat alone. Jared wants to know when Jared's day is, since today is Daddy's day. He also wants to know if he can have waffles in bed and steak for dinner on Jared's day. Not likely. We all agree that this has to be the best Daddy ever made. I think you can see why. I don't know if we can ever do enough to thank this Daddy for all of the hard work, the sleepless nights, the example he sets, the service he does, and the dedication he has to his family. Today, to all of the dads and grandpas who have and are tirelessly sacrificing themselves for their families, happy Daddy's Day!